VRay Mtl stands for Vray Material and is a very powerful and most used shader in Vray. It is videly used in 3D architectural renderings and 3D architectural animations because it can simulate the vast majority of real life materials, from hard metallic surfaces to soft and diffuse ones. This free Vray Mtl interactive tutorial by the Swiss 3D rendering company VisualCenter explains all attributes of the Vray Mtl shader. “Diffuse Color” is the diffuse color of the object. This value can be a flat color or a texture map. Diffuse “Amount” is the brightness of diffuse color. This value is multiplied with color, therefore by default 1, the final color equals the diffuse color. If weight is 0.5, the final color is 50% of its value. “Opacity Map” is the visibility of the object. This is mostly used as a silhouette technique for leaves, branches, and people. This attribute must not be confused with transparency, it is not intended to be used to shade glass, water and other transparent objects as it doesn’t preserve reflections and refractions. By decreasing “Opacity Map” you simply make the entire object unrealistically disappear. “Roughness Amount” is how rough a material appears. Hard surfaces like metals are usually rendered with the default value of 0, causing the object to look brighter at front angles. Rough materials like skin, rubber, and cloth tend to look more flat because they scatter light diffusely from every angle. Notice in the simulation how by increasing roughness the objects receive a more flat look. Remember if you increase roughness also to decrease “Reflection Glossiness”, rubber for example has not only rough diffuse color but also rough reflections, leaving reflections sharp would make it look not convincing. “Self-Illumination” is the equivalent of a Maya shader’s “Ambient Color” or “Incandescence”. It’s used to self-illuminate an object like a TV monitor or light bulb. This value can also be higher than 1. Note however that this attribute is not meant to be used as a light source to illuminate a scene since it doesn’t give control over lighting quality. Instead, go to Create> V-Ray > Mesh lights > Turn selection into lights. “Compensate Exposure” lets you choose whether or not camera exposure adjustments affect “Self-Illumination”. If for example you increase the camera’s shutter speed you allow less light to enter the lens, this means light sources, primary illumination, GI, caustics and of course also self-illuminating objects become darker. In the simulation you can see that by leaving this attribute by default Off, the entire scene, including the light bulb, becomes darker. On the other hand, if turned On, camera exposure doesn’t alter the appearance of the light bulb. A rule of thumb is, if you’re happy with the look of the self-illuminating object, activate this attribute so you can freely adjust the scene’s exposure without affecting “Self-Illumination”. “Brdf Type” determines the way a material reflects. “Phong” renders the fastest and is the only one where “Anisotropy” parameters are not available. This type is mostly used for plastic. “Blinn” is the second fastest at rendering and is used for chrome materials while “Ward” for brushed metals and steel. Notice how “Phong” has much sharper and harder reflections than the others. “Reflection Color” is the color of reflections. Usually it’s white for materials like plastic or covered in finish like car paint. In more diffuse materials reflections gain some coloring. Skin for example reflects a subtle bluish color, rust a brownish color; generally all reflections are slightly affected by the overall diffuse color and simulating it in the render adds realism. Reflection “Amount” is the object’s overall reflectivity. Since VRay shaders are energy conserving, reflection subtracts diffuse, this means that the more reflective the material become, the less diffuse color it emits. In this simulation you can see how with reflection amount 1 the car doesn’t emit any red color at all. “Reflection Exit Color” is the color reflection rays render once they reach their “Max depth” value. Reflective materials cast reflection rays into the scene to determine which color to render, if they hit another reflective surface they bounce off again to determine the next color. The number of times they are allowed to bounce is “Max depth”, which by default is set to 5; in this simulation it’s set to 2 to show areas where they reach this limit and return the “Reflection Exit Color” instead of further bouncing within the scene. “Lock highlight and reflection glossiness” is by default On and uses the “Reflection Glossiness” value for “Highlight Gossiness”. In this simulation you can see how by turning this attribute Off I am able to blur only the roof highlights while leaving reflections sharp. “Highlight Glossiness” controls how blurry highlights appear. This attribute equals “Reflection Glossiness” as long as “Lock highlight and reflection glossiness” is activated. Notice how the scene’s reflections remain unchanged while only the rooftop highlights are affected. “Reflection Glossiness” is the blurriness of reflections. By default 1 reflections are glossy (sharp) like a mirror. The rougher a material is and the less glossy (matte) its reflections are, resulting in blurred reflections. Notice in this simulation how by increasing blurriness noise starts to appear, to solve this increase reflection subdivisions. “Reflection subdivisions” are the number of samples used to calculate reflections. The blurrier reflections are, the more subdivisions they require to render smoothly and consequently increase render time. “Use interpolation” for reflections is by default Off and uses the “Reflection Glossiness” and “Reflection subdivs” parameters to render reflections. The more you blur reflections, the noisier they appear, the two methods to fix this issue is by increasing subdivisions or activating “interpolation”, which uses a grid to blur reflections. Be careful not to use interpolation in animations as it results in excessive flickering and grid like pattern looks. Interpolation doesn’t work with sharp reflections (glossiness value of 1). In this example the floor is rendered with a glossiness value of 0.9. You can fine tune interpolation attributes below in the “Reflect interpolation” tab. “Use Fresnel” calculates reflections based on the Fresnel equation. This states that materials reflect more when viewed at low angles than from the front. In this simulation you can see that by turning this attribute Off the car is equally reflective at all angles and therefore appearing unrealistic. “Use Fresnel” is by default enabled because it is true for all real world materials. Only for extreme cases like mirrors “Use Fresnel” can be turned Off. “Lock Fresnel IOR To Refraction IOR” is by default On and uses the “Refraction IOR” for the reflection “Fresnel IOR”. The reason why these two values are connected is because in real world the degree of reflected light is proportional to the degree of refracted light. In this simulation, with this attribute turned On, the statue is rendered with both reflective and refractive index of 1.33, which corresponds to water. When turning this attribute Off, I increased the reflection IOR to 3 while leaving the “Refraction IOR” unchanged, notice in fact how the red poles we see through the statue (refractions) don’t change, but that only the statue’s front reflectivity increases. Be aware that turning this attribute Off does not produce physically correct results. In this example, by increasing the reflection IOR means that the material becomes harder, like metal, resulting in stronger front reflections, this should inevitably also cause refractions to become more distorted, and not left unchanged. “Fresnel IOR” controls how much light is deviated when bouncing off a reflective material. A value of 1 causes no change in direction, meaning that it has the same density as air. The harder the material, like chrome and metals, the more it reflects at angles facing the viewer and therefore higher IOR values are required. For softer materials like fabric, where reflections are seen only at low angles, lower values are required. Since in this simulation “Lock Fresnel IOR To Refraction IOR” is disabled, we can see how only reflections and not refractions are affected. 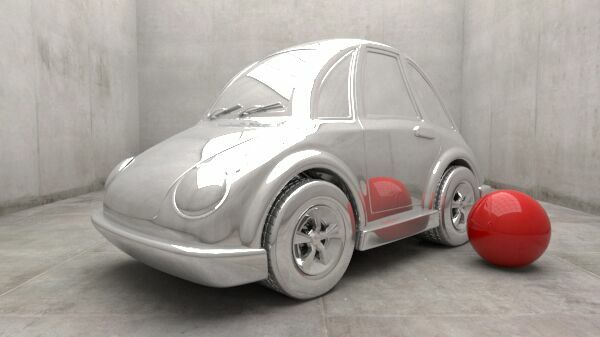 “Trace Reflections” is by default On and allows VRay to calculate reflections for the material. “Max depth” is the number of times reflection rays bounce to determine the reflection color. Once they have reached this limit they stop bouncing and render the “Reflection Exit Color”. “Reflect On Back Side” is by default Off and prevents backsides of polygons to unnecessarily render reflections and therefore saving render time. The “Back Side” of a surface is the opposite side where Normals point. It often happens that an object seems not to render reflections at all no matter how high reflectivity is set to, the cause can usually be that the object has its Normals pointing inwardly and therefore its visible surface, being considered its “back side”, doesn’t render reflections. To solve this problem reverse its Normals or turn On this attribute. In this simulation the bottle has a single surface and by turning On this attribute we’re able to render reflections on both front and back sides. “Soften edge” blurs dark borders that might appear on the edges of highly reflective and matte objects. By default these are already hidden by an attribute called “Fix Dark Edges”, found in the “Options” tab. This is the reason why it seems that “Soften edge” doesn’t have any impact on the render at all, because you are blurring edges which are not visible. If you turn Off “Fix Dark Edges” however these will become visible. Reflection “Dim distance On” is by default Off and allows reflection rays to travel infinitely within a scene to calculate their reflection color. By activating this attribute you can set a distance at which these rays stop travelling and instead render the shaded points as non-reflective. This technique can be used to eliminate unwanted reflections coming from distant objects. Reflection “Dim distance” is the distance at which reflection rays stop travelling. Reflection “Dim fall off” decays reflection rays resulting in a blurred transition between reflections and non-reflections. A value of 1 renders the reflection at distance 0 as opaque and gradually fades off till the “Dim distance” value. A “Dim fall off” of 0.5 renders opaque reflections from distance 0 till the half of “Dim distance” and then starts to fade. Reflection’s “Affect Channels” lets you choose which channels are affected by reflectivity. This parameter is only relevant if you’re working with transparency and its primary use is intended for postproduction, for example adding a background image behind this square window while keeping the sphere reflection intact. In this simulation you can see how by default “Color only”, as the name implies, reflections only affect colors of the shader and not its transparency (alpha). If you switch to “Color + alpha” you see how only the window becomes transparent while living the sphere’s reflection opaque. The last adjustment, “All channels”, has the additional benefit of also affecting render elements (channels). Notice how the lighting and reflection pass becomes visible in the window reflections. This option however does significantly increase render time and should therefore be used only if necessary. “Anisotropy” stretches reflections to simulate parallel running micro fibers materials like CDs and brushed metals. When a surface is flat or homogeneously bumpy (isotropic), its reflections don’t change depending on the object’s rotation or direction, but when looking at a fiber carved material (anisotropic), they do. In such a situation, specular highlights tend to be elongated and run perpendicular to the direction of the grooves. The default value of 0 stands for a flat surface without anisotropy, decreasing the value stretches reflections horizontally and increasing the value stretches them vertically. Important: anisotropy does not work with the Blinn “Brdf Type” or if “Reflection Glossiness” is set to 1. “Anisotropy UV cords” allows you to map a texture file to change the UV coordinates used to calculate anisotropy. “Anisotropy Rotation” is the orientation of the microfibers. 0 stands for 0 degrees and 1 for 360 degrees. “Refraction Color” is the color of refracted light. Refraction “Amount” determines how transparent an object is. Notice how by increasing transparency the color of the objects disappears, this is because the more refractive an object becomes, the less diffuse color it emits. “Refraction Exit Color On” allows you to set a color to render once refraction rays have reached their “Max depth” value. “Refraction Exit Color” is the color that a refraction ray renders once it has reached its “Max depth” value. “Refraction Glossiness” determines how blurry refractions are. By default 1, refractions render perfectly sharp. Decrease the value to increase blurriness. “Refraction subdivis” determines how many rays are used to calculate refractions. The blurrier refractions are, the noisier they appear and need therefore more subdivisions. In this simulation “Refraction Glossiness” is set to 0.5 and a light is placed behind the statue to accentuate the noise effect. “Use interpolation” for refractions is by default Off and uses the “Refraction Glossiness” and “Refraction subdivs” parameters to determine the appearance of blurred refractions. The blurrier they are, the noisier they appear, the two methods to fix this is increasing “Refraction subdivs” or activating “interpolation”, which uses a grid to blur refractions. Be careful not to use interpolation in animations as it results in excessive flickering and grid like pattern looks. Interpolation doesn’t work with sharp refractions (glossiness value of 1). In this example the object was rendered with a glossiness value of 0.8 and you can notice the presence of noise which disappears with interpolation. You can fine tune interpolation attributes below in the “Refract interpolation” tab. “Refraction IOR” determines the degree of light deviation within a transparent object, water for example has an IOR of 1.33. In a few words, index of refraction can be seen as “the hardness of a surface”. You can see in the simulation how by increasing this value the image behind the statue become more and more distorted because light travels through it at a much slower speed. Living in the atmosphere, the air around us does not deviate light and has therefore a value of 1, you can see in fact how we can see straight through the statue if it was made of air. For the sake of isolating the refraction effect in this simulation, I have unchecked the “Lock Fresnel IOR To Refraction IOR” option. Read more about this in the “Reflection” chapter. “Fog Color” is the color of the “filling” of the object. Important: don’t use pure colors with brightness value of 1 like perfect green, red, yellow, white, etc. because since they don’t have any actual black values they won’t render any “darkness” caused by light absorption. In fact, the default value is white, which means light passes through the object without being absorbed at all, thus not rendering any fog effect. Instead use colors with lower brightness values than 1. “Fog multiplier” simulates the thickness of the object giving the impression that thick objects let less light pass through. Fog parameter depends on the object ‘s dimensions. “Fog bias” is the ratio between thick and thin parts of the object. If you decrease the value you allow only thin parts of the objects to let light pass through, in this simulation you can see how only the thin tips of the teeth and ears transmit the green light. On the other hand, increasing the value means to let light pass also through the thicker parts of the object, in this case the boar’s head and chest. The default value of 0 means that VRay renders this ratio as default. “Trace Refractions” enbables VRay to calculate refraction rays. Refractions “Max depth” is the number of times a refraction ray is allowed to refract through a transparent surface. The default value of 5 is usually enough to render most scenes but might need to be increased for complex scenes with many transparent objects. “Affect Shadows” is by default Off and can be turned On to cast transparent shadows according to “Refraction Color” and “Fog Color”. Important: for correct results disable “Affect Shadows” if you are rendering caustics. Refraction’s “Affect Channels” lets you choose which channels are affected by refraction. This parameter is only relevant if you’re working with transparency. Its primary use is intended for post-production, in this case a background image needs to be placed behind the car’s windows. With the default value of “Color only”, as the name implies, refractions only affect the color of the shader and not its opacity (alpha), hence windows render an opaque sky color and therefore it’s not possible to place any background image behind it. The “Color + alpha” option solves this issue by assigning a correct alpha based on transparency. With “All channels” all render elements (channels) are affected. This option however does significantly increase render time and should therefore be used only if necessary. “Dispersion” simulates light of different wave length to refract at different degrees, creating the rainbow effect. “Dispersion Abbe” is the amount of the dispersion effect. Lowering the value will increase the effect and vice versa. “Map Type” determines how the bump map parameter is interpreted. “Map” allows you to use a texture map to bevel the surface. White pixels bump the surface upwards, along its normal direction, while dark pixels inwardly. “Bump Multiplier” multiplies the bump “Map” attribute. By default 1, VRay reads the bump map as it is, where white pixels equal 1 and bump the surface upwards, along the object’s Normals. Increasing “Bump Mult” deepens the bump effect while if lowering the value below 1 flips the bump values causing dark pixels to render upward bumps and bright pixels inward bumps. “Bump Shadows” is by default Off and can be activated to slightly improve bump shadows. It is however recommended to keep this feature Off. “Bump Delta Scale” is the scale of the map used for sampling, Vray by default already estimates an ideal value. Increasing it results in a more blurry bump appearance and vice versa. Subsurface scattering “On” activates subsurface scattering for the VRay Mtl. This simulates light passing through the surface of the object. Important, this attribute works in conjunction with fog and therefore doesn’t work if “fog color” is set to white, or any other color with brightness value of 1. In this simulation “Fog Color” is set to bright grey and “Translucency Color” to red. Also, the material must have some degree of transparency, opaque objects to not render subsurface scattering. “Translucency Color” is the color light gains when passing through the object. If you further wish to tint the subsurface color you can add some “Fog Color”. Subsurface scattering “Subdivs” are the number of samples used to calculate subsurface scattering. Increase the value if there is noise in the scattering you want to remove, this will however considerably increase render time. It is recommended to use exponents of 2 such as 8, 16, 32, 64, etc. because values in between might give same results as Vray won’t be able to calculate samples in an optimal manner. Subsurface scattering “Fwd/back coeff” determines whether you favor forward or backward subsurface scattering. First of all, the name says “forward / backward” and the value slider goes from 0 to 1. This means that the far left of the slider (0) sets subsurface scattering to “forward-only” while the far right (1) to “backward-only”. Be careful not to misunderstand the meaning of the two terms, in fact “backwards” does not actually mean that a light source placed behind an object becomes more visible, but rather the opposite. In fact, “backward” means that a light ray hits the surface of an object and then bounces backwards. Notice how the panel on the right becomes more reddish because light hitting it from the front bounces back. On the other hand, “forward” means that a light ray hits an object and continues to travel forward, through the object and exiting on the other side, this is why the left panel in this simulation becomes more red. Since the default value is set to 1 and therefore doesn’t allow any forward scattering, it is recommended to set this value somewhere in the middle point. Subsurface scattering “Scatter bounces” determines how many times light is permitted to bounce within an object. 0 deactivates the effect while increasing the value results in more scattering and therefore brighter object; notice also how noise increases, to fix this increase “Subdivs”. “Scatter coefficient” determines how much light is distorted within an object. The default value of 0 causes light to disperse in all directions within the object while a value of 1 forces light to travel straight. The visible difference in this simulation is very subtle but you can see how by increasing the value, the left panel does scatter red light more in the vicinity of the spotlight’s source, hence where light passes straight through it. Subsurface scattering “Thickness” simulates how thick an object is. Also this attribute is counterintuitive because by decreasing the value you don’t actually render the object “thinner” but rather allow less light to pass through. In fact, the default value is set at 1000 to let light pass through the entire volume of the object. “Environment fog” is by default Off and when activated will take into account only direct illumination, in this case the left green and the right blue spotlight, to compute subsurface color computation. “Translucency Color”, in this case red, will no longer affect the scattering color. “Cutoff threshold” defines the value below which Vray stops calculating refractions and reflections. It is recommended to leave this value at default 0.001 as it ensures most accurate results. Do not set this value to 0 because it might cause enormous render times by causing rays to endlessly bounce within the scene. You can increase this value if you wish to speed up render time by skipping reflections and refractions. In this interactive simulation the left object is semi-transparent (refractive) and the right one is reflective. Notice how at a “Cutoff threshold” value of 1 only the grey diffuse color remains. “Double Sided” is by default On and uses both front and back faces to compute lighting calculations. “Fix Dark Edges” is by default On and removes dark borders that might appear around edges of highly reflective and matte objects. If you deactivate this attribute these borders become visible and you can use the “Soften edge” attribute, found in the “Reflection” tab, to fade adjust their strength. Reflect interpolation “Min rate” and “Max rate” determine the resolution of the first interpolation pass and respectively the last interpolation pass. The default value of -1 tells Vray to use half of the resolution of the final image, 0 means the same resolution, and 1 double resolution. “Min rate” should not exceed “Max rate” otherwise it will render incorrectly, it is recommended to use the same value for both attributes. Reflect “Interp. Samples” determines the number of samples used to calculate blurred reflections. Larger numbers produce smoother results at the expense of blurring out details while smaller numbers preserve more details but also present more blotchiness. Reflect interpolation “Normal threshold” defines how sensitive the interpolation algorithm is towards changes in surface Normals. In other words, the more complex the object is in terms of curvatures and details, the more you need to reduce “Normal threshold” in order to calculate finer and more accurate results. Be careful not to lower this value too much or noise and blotchiness will start to appear. Higher values produce smoother results but wash out surface details. Refract interpolation “Min rate” and “Max rate” determine the resolution of the first interpolation pass and respectively the last interpolation pass. The default value of -1 tells Vray to use half of the resolution of the final image, 0 means the same resolution, and 1 double resolution. “Min rate” should not exceed “Max rate” otherwise it will render incorrectly, it is recommended to use the same value for both attributes, as in this simulation. It is however not recommended to increase this rate above the default value as it drastically increases render time. Refract “Interp. Samples” determines the number of samples used to calculate blurred refractions. Larger numbers produce smoother results at the expense of blurring out details while smaller numbers preserve more details but also present more blotchiness. Refract interpolation “Normal threshold” defines how sensitive the interpolation algorithm is towards changes in surface Normals. In other words, the more complex the object is in terms of curvatures and details, the more you need to reduce “Normal threshold” in order to calculate finer and more accurate results. Be careful not to lower this value too much or noise and blotchiness will start to appear. Higher values produce smoother results but wash out geometry details.